Opportunism is a behavior that takes advantage of knowledge asymmetry and results in promoting agents' own value and demoting other agents' value. It is important to eliminate such a selfish behavior in multi-agent systems, as it has undesirable results for the participating agents. However, as the context we study here is multi-agent systems, system designers actually might not be aware of the value system for each agent thus they have no idea whether an agent will perform opportunistic behavior. 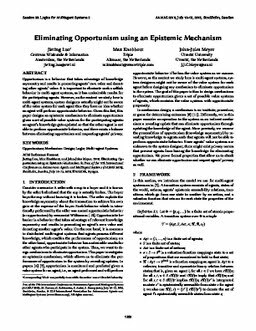 Given this fact, this paper designs an epistemic mechanism to eliminate opportunism given a set of possible value systems for the participating agents: An agent's knowledge gets updated so that the other agent is not able to perform opportunistic behavior, and there exists a balance between eliminating opportunism and respecting agents' privacy. Luo, J, Knobbout, M, & Meyer, J.-J.C. (2018). Eliminating opportunism using an epistemic mechanism. In Proceedings of the International Joint Conference on Autonomous Agents and Multiagent Systems (pp. 1450–1458).